I remember as a child, I hated chickpeas. I would get seriously upset if they made their way into my salad. Oh how times have changed! There are so many ways to eat chickpeas but I’ve recently discovered my favourite – roasted with hot sauce. I found my inspiration on Modern Mom. However, I didn’t want to use Earth Balance or butter so I swapped them with garlic olive oil. It added some extra flavour and all the great benefits of a healthy fat. Preheat your oven to 450 degrees. Line a baking sheet with foil for easy cleanup. 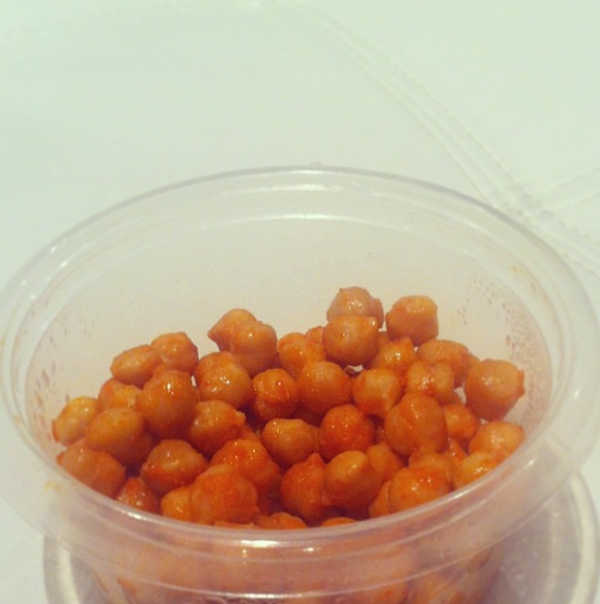 Drain and rinse your can of chickpeas and put them into a bowl and add the EVOO, garlic powder and hot sauce. Toss the mixture to coat evenly. Now I have noticed that bake times have varied throughout all of the recipes I’ve seen. I roasted mine for 30 minutes and found that to be just right. You know they’re done when they are starting to brown. This usually makes two servings which can easily be separated with tupperware. I bring mine to snack on in class a few times a week and let me tell you, nothing else has been as satisfying! They have just the right amount of protein to be a sufficient snack but not too filling. Tags: bariatric, bariatric recipes, bariatric snacks, bariatric surgery, buffalo roasted chickpeas, gastric bypass, gastric bypass recipes, gastric bypass snacks, gastric bypass surgery, healthy snacks, protein packed snacks, rny, roasted chickpeas, weight loss, weight loss surgery, weight loss surgery recipes, weight loss surgery snacks, wls. Bookmark the permalink. I love crispy chickpeas! Defs trying this. If you try them let me know how they turn out! They’re the best in my eyes! !